I spent this past weekend in London because of a wedding. 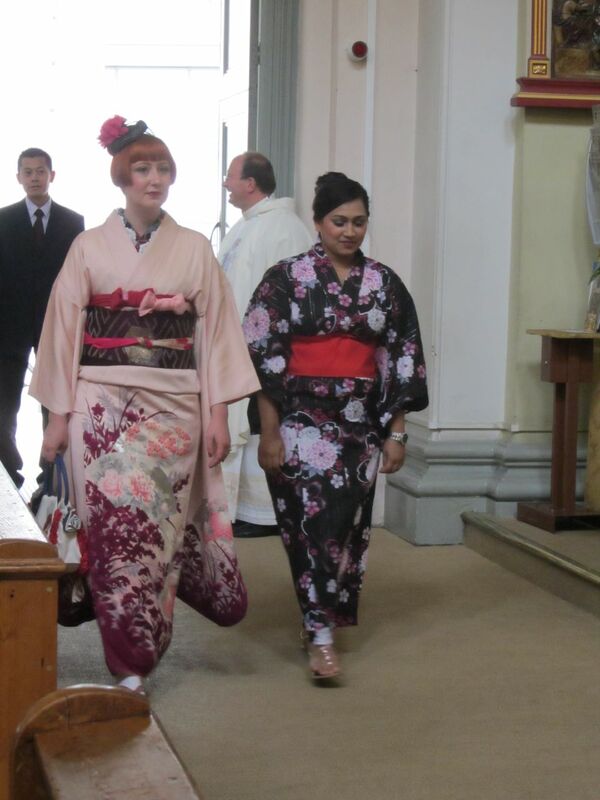 Hong was getting married, and she had a non-traditional Japanese wedding, so of course I had to wear kimono. She said to go all out, and so I did! I choose to wear my newest furisode, although I had it for close to half a year now. Technically, this is only my second time EVER wearing a furisode, the first time being my birthday in 2008. But since it was a non-traditional wedding, I didn't care that I'm married and shouldn't be wearing furisode anymore. My husband and I checked into the same hotel as she was staying at on Friday. On the day of the wedding, we actually switched rooms for the morning because our room turned out to have the most space, and Hong needed all the space she could get to get dressed. 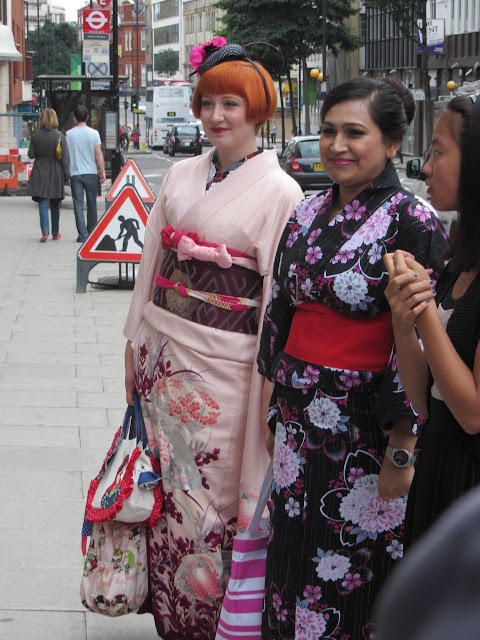 She hired Kimono de Go to dress her, but used all of her own kimono. I got dressed in the other room and came back to our room at the last minute to watch Mamiko-san from Kimono de Go put finishing touches on Hong. We encountered a semi-minor set back when we found out that the car that was supposed to take us to the church had left, because the front desk idiot person told the driver that he saw a bride to get into another white car... Who knew there were more weddings going on and more white cars picking up brides? Regardless, the driver shouldn't have left without his bride and the front desk person shouldn't have said anything other than please call the person who hired the car. Hong said that I looked like I was about to throttle him because he tried to make chit chat (his words) while we were waiting for the taxi we asked him to get. It was all confusing and annoying, but we finally got to the wedding fashionably late. 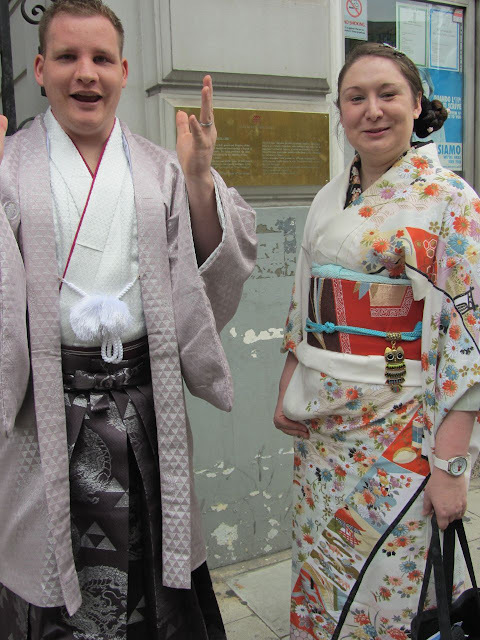 My husband wore a formal kimono set that we borrowed from Hong, because we actually don't own a formal set that fits him properly. Incidentally, we matched! And also incidentally, he is in love with that set now, so I'm going to be on the lookout for another one for him :). I was very excited to be in the wedding party! 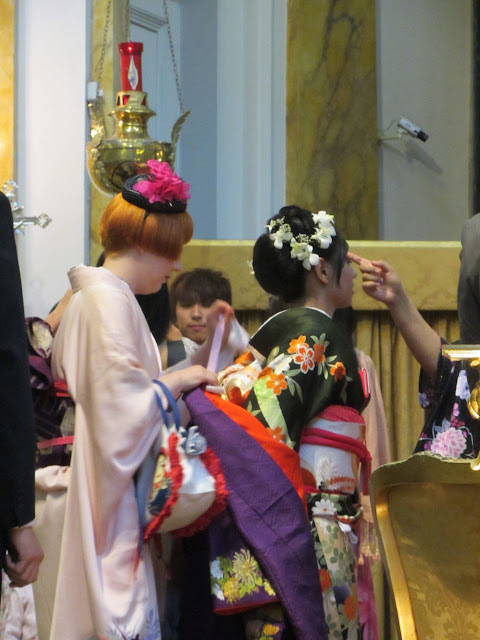 Afterwords, I helped Hong to take off her kimono of doom uchikake so she could breathe again and not risk falling over. We took some photos in the church, and while everyone else stayed behind, I went to the reception place with the other bridesmaid and several other people. She set up the cake while I got Robert to take photos of me. This is not a proper musubi, but something I've made up on the go. Hong actually let me borrow her biyosugata, but I took one look at that thing and decided that it would be better if I could just tie my obi without. Even if it's not a proper musubi, it held up for a whole day and looked pretty good, so I was happy. Overall it was a great wedding and I had a blast. Hong looked absolutely GORGEOUS and I can't wait to see the professional photos! Wow, you look really beautiful! But Hong looks absolutely stunning!. And I so love your musubi and Hongs hair!